Some child seat manufacturers make child restraint seats that are labeled as ISOFIX or ISOFIX-compatible child restraint seats. These seats include two rigid or webbing mounted attachments that connect to two ISOFIX anchors at specific seating positions in your vehicle. This type of child restraint seat eliminates the need to use seat belts to attach the child seat for forwardfacing child restraint seats. There is a symbol located on the lower portion of each side of the rear seatbacks. 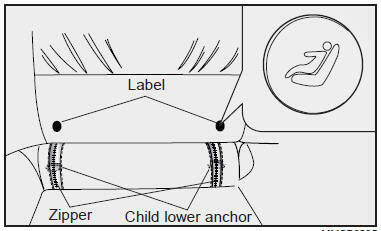 These symbols indicate the position of the lower anchors for child restraints so equipped. A zipper is located directly beneath each indicator, which when opened will expose the metal anchor. ISOFIX anchors have been provided in your vehicle. The ISOFIX anchors are located in the left and right outboard rear seating positions. Their locations are shown in the illustration. There is no ISOFIX anchor provided for the center rear seating position. Follow the child seat manufacturer’s instructions to properly install child restraint seats with ISOFIX or ISOFIX-compatible attachments. Once you have installed the ISOFIX child restraint, assure that the seat is properly attached to the ISOFIX and tether anchors. Also, test the child restraint seat before you place the child in it. Tilt the seat from side to side. Also try to tug the seat forward. Check to see if the anchors hold the seat in place. Do not mount more than one child restraint to a single tether or to a child restraint lower anchorage point. The improper increased load may cause the anchorage points or tether anchor to break, causing serious injury or death. Do not install a child restraint seat at the rear center seating position using the vehicle’s ISOFIX anchors. The ISOFIX anchors are only provided for the left and right outboard rear seating positions. Do not misuse the ISOFIX anchors by attempting to attach a child restraint seat in the middle rear seating position position to the ISOFIX anchors. In a crash, the child restraint seat ISOFIX attachments may not be strong enough to secure the child restraint seat improperly in the rear center seating position and may break, causing serious injury or death. 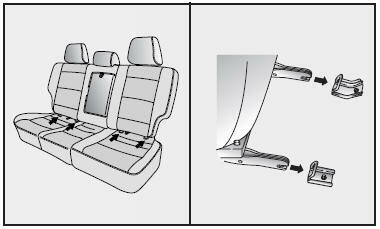 Attach the ISOFIX or ISOFIX-compatible child restraint seat only to the appropriate locations shown in the illustration. Always follow the installation and use instructions provided by the manufacturer of the child restraint.